Happy Memorial Day everyone, and Happy Birthday to my wonderful husband, John! The kids and I love that John’s birthday falls on a Holiday weekend because we always get to spend a full day celebrating with him. Zoe and I made his favorite coconut cake (recipe soon) while he supplied the homemade coconut ice cream. What a man! 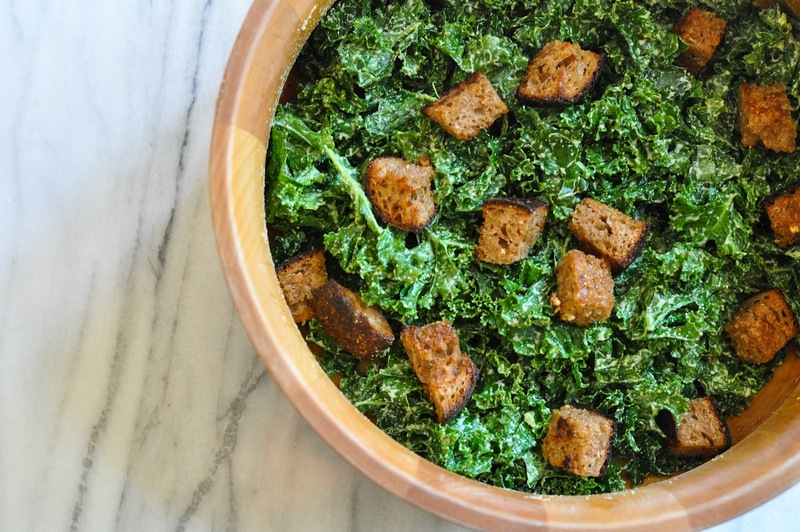 So, I am celebrating this day by showcasing a vegan kale caesar salad! Yaay! I can’t get enough kale, and I am assuming most of you are the same way. Kale is the “it” vegetable of 2012, (at least in my world). This is not your typical caesar salad though because it’s egg and dairy free. 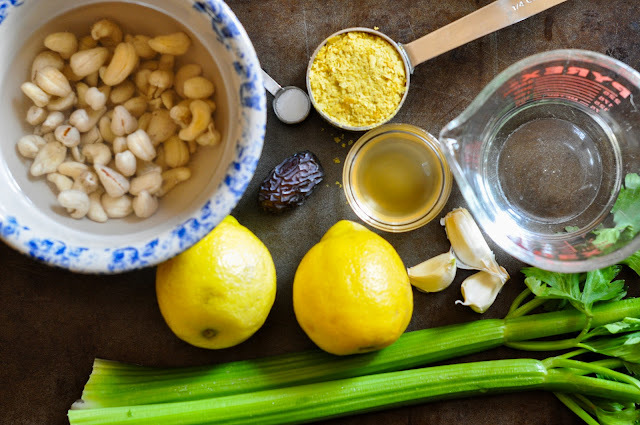 It’s definitely a healthier take on the traditional caesar salad. 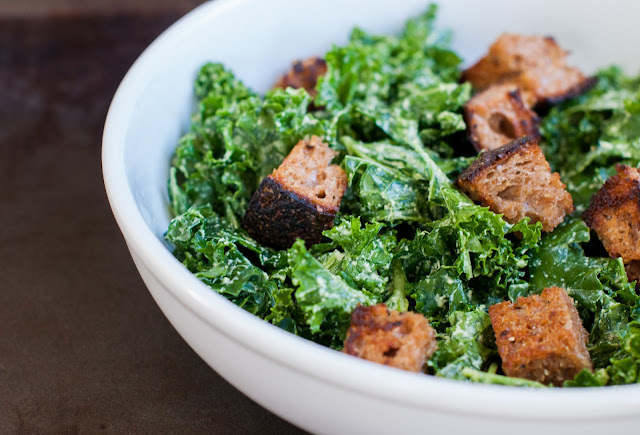 I love having a big salad for lunch, so I am always on the search for new recipes, especially kale ones. I also love croutons, and these croutons are the BEST! They are chewy and crunchy at the same time. You all know that I love carbs and kale, so this was lunch was a winner in my book! I found that this particular kale salad was best served fresh. It was fine for leftovers, but I found that I needed to refresh it with some dressing as the kale really absorbed all the dressing overnight and became a bit dull in flavor. I paired this salad for dinner with some of my sausage and arugula pizza , and it was the prefect compliment. Note: There will be extra dressing leftover as the dressing makes 1 cup. You can reserve this for additional salads or cut the dressing recipe below in half. I actually used the extra dressing to re-fresh the leftover salad. Wash, de-stem & tear up the kale into bite size pieces and set it aside in a salad bowl. 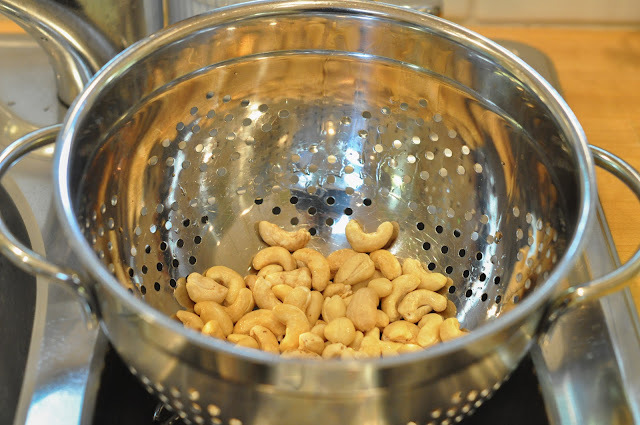 Measure out the 3/4 cup cashews and rinse them in a colander. 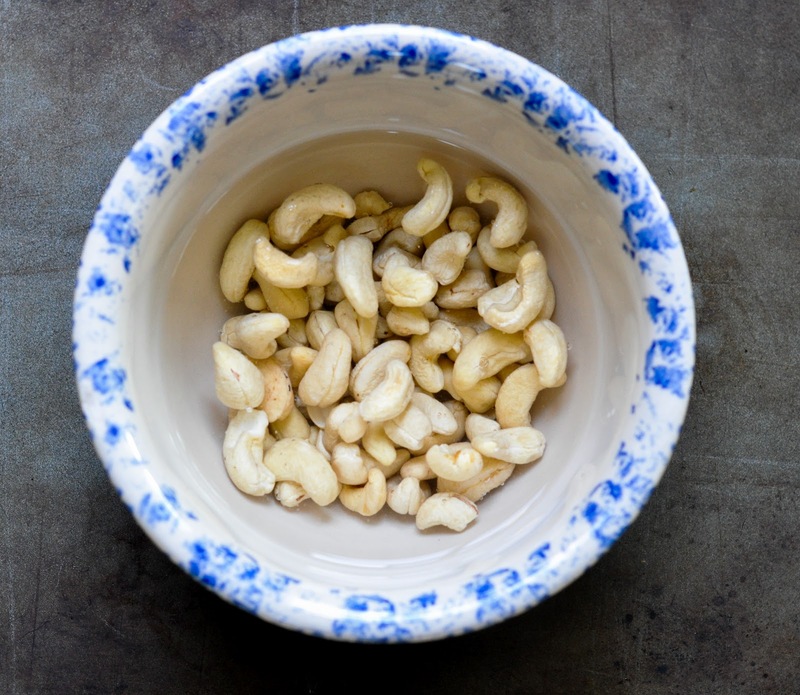 Place them in a glass or ceramic bowl and cover them with fresh filtered water. 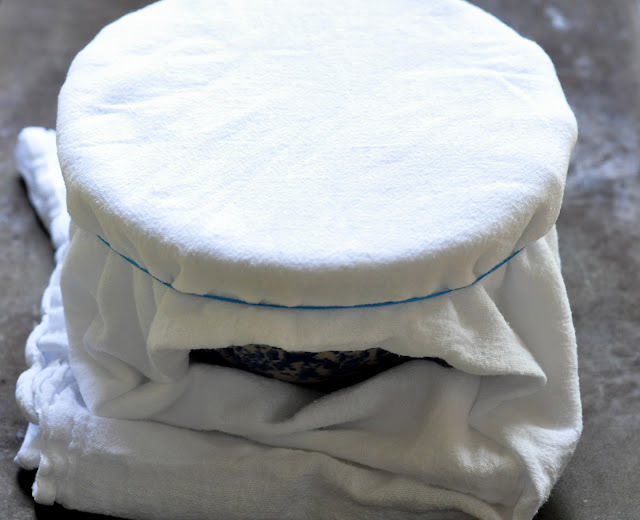 Cover the bowl with a clean dishtowel and let them soak for 2 hours. 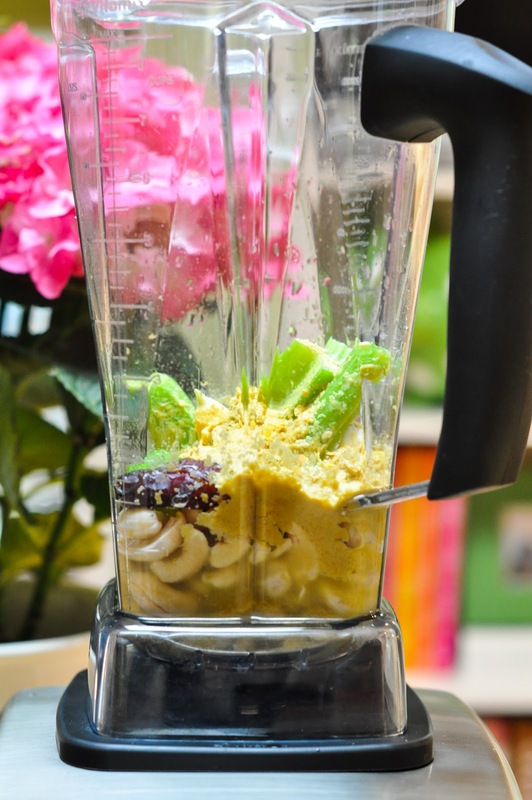 Add cashews to a food processor or high-powered blender (I used my vitamix). Add the nutritional yeast, lemon juice, Medjool date, celery (I cut the celery into 3 large chunks to make pureeing it easier), garlic cloves, apple cider vinegar, sea salt and water and process/blend until smooth. Note: This dressing will be thick, but when you mix it into the kale it has a nice consistency. 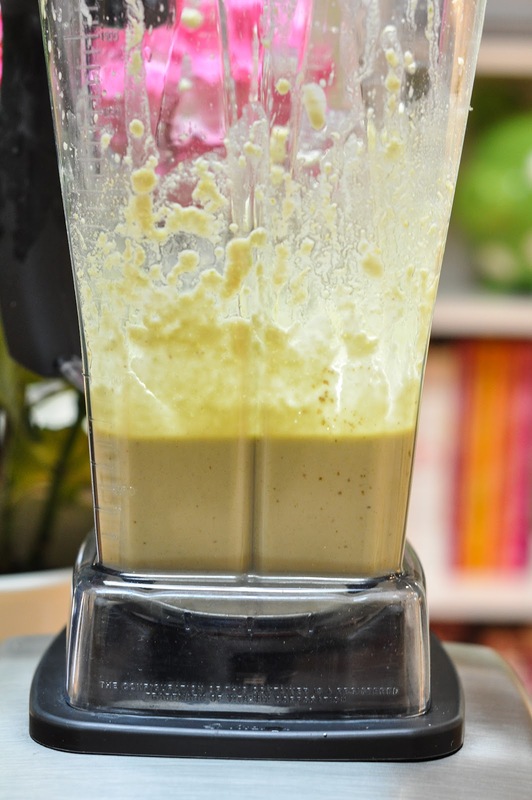 Pour 1/4 to 1/2 cup of the dressing over the kale and mix well so that all the kale absorbs the dressing. I actually massaged my kale a bit so the kale really absorbed the dressing. 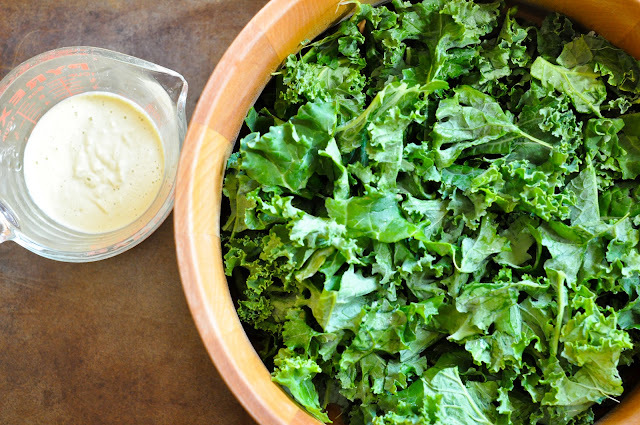 You don’t have to go crazy massaging this kale salad. When I say, “massage” your kale, I literally mean, get your hands in there and massage it. The volume of the kale should reduce by about 1/3 and the kale will wilt and have a cooked texture. Feel free to add more dressing if desired after you massage it, as the kale will absorb it. 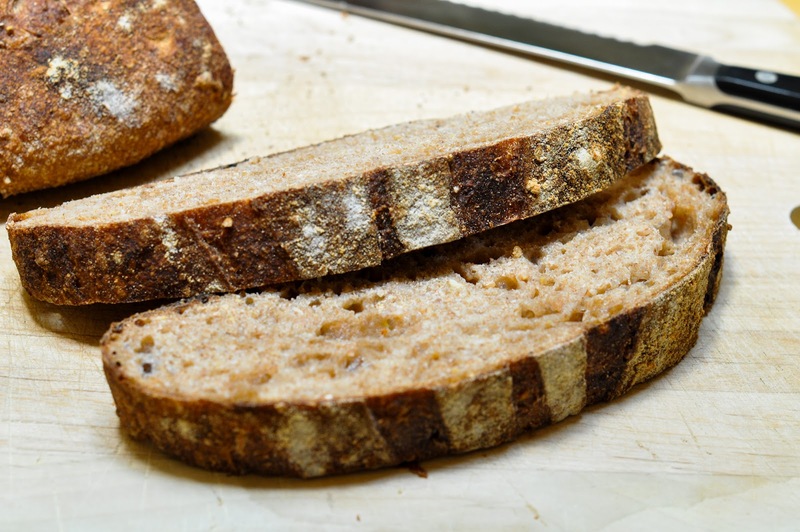 2 thick slices of multi-grain or dark grain bread – You can use any kind of bread here, but I loved the chewy texture of this multi grain bread. For those of you that are local, I got this bread was from the Whole Foods in San Rafael. It’s from Della Fattoria and the name of the bread is Pane Integrale. 1/4 to 1/2 teaspoon freshly ground pepper – I actually don’t measure out my pepper. I just twist the pepper grinder a few times. 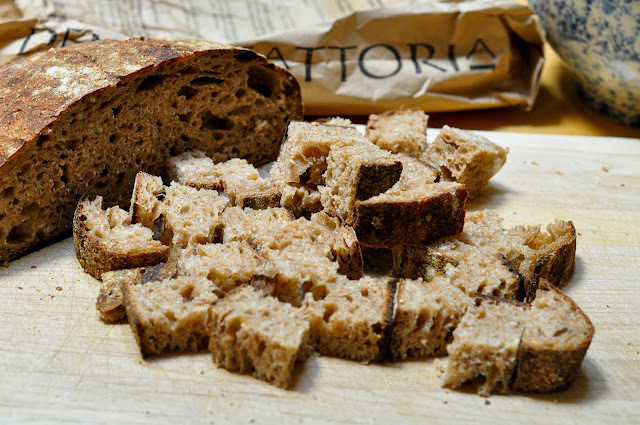 I took my other crouton recipe, added 2 cloves of minced garlic to it and used this amazing whole-grain dark bread. 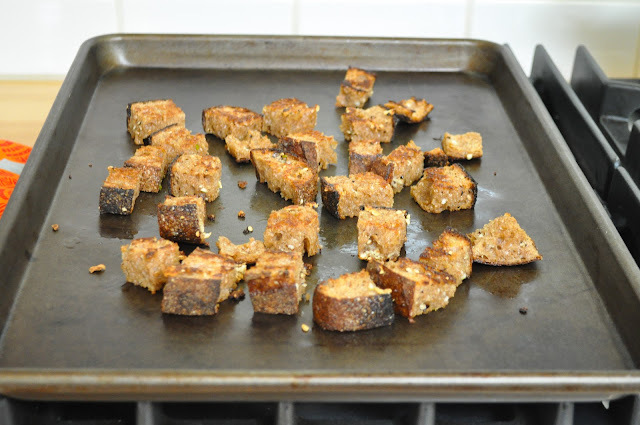 Needless to say, these croutons were AMAZING! Pre-heat your oven to 425 degrees. Slice up 2 thick slices of bread. Cut the slices into 1/2 inch cubes. In a medium sized bowl add the olive oil, minced garlic, pepper and salt and mix them together. Throw in the croutons and toss to coat. 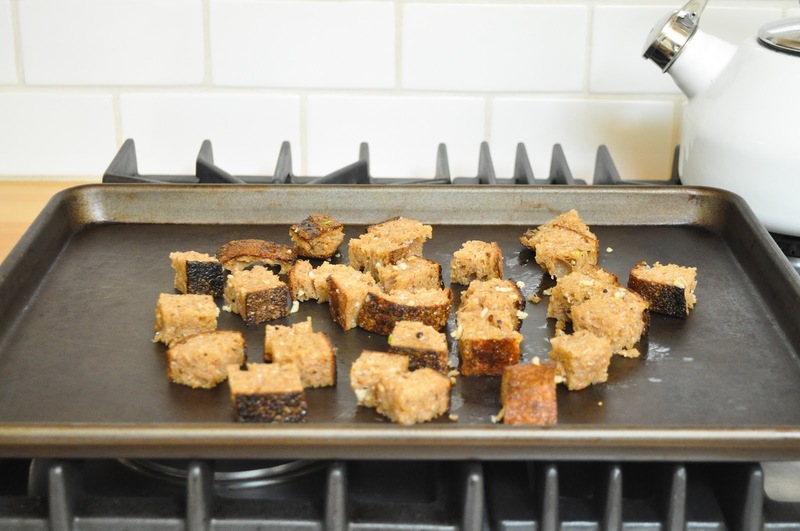 Spread in a single layer on a rimmed baking sheet. Bake for approximately 10 to 12 minutes, making sure to flip the bread over once during baking so it browns on both sides. 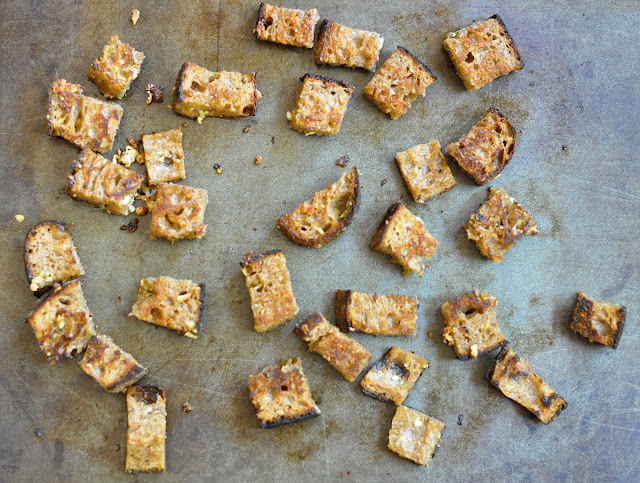 Bake until the croutons are browned and crisp. 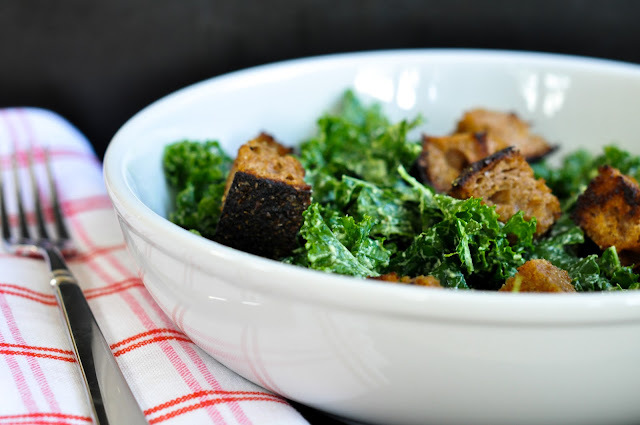 Top the kale salad with the homemade croutons and serve. This salad is a healthier take on the traditional caesar salad. 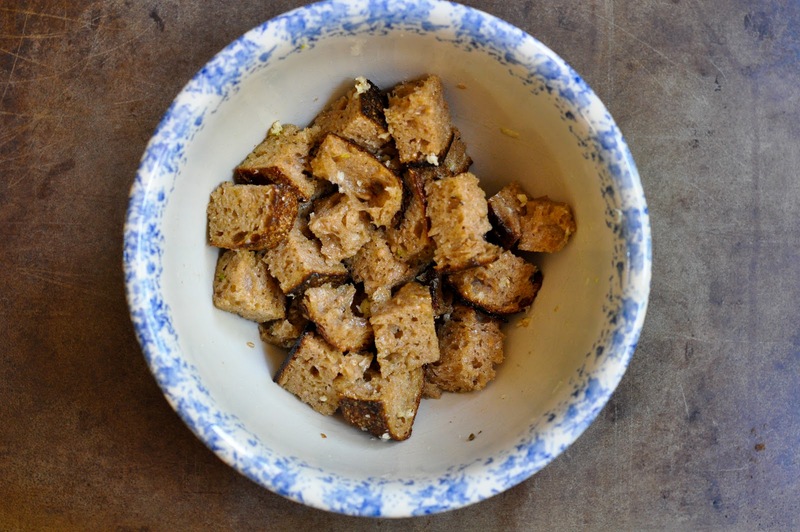 If you’re looking for another healthy caesar salad recipe that actually tastes more like a traditional caesar salad, then try my miso garlic roasted tofu salad. Looking for more kale salad recipes? 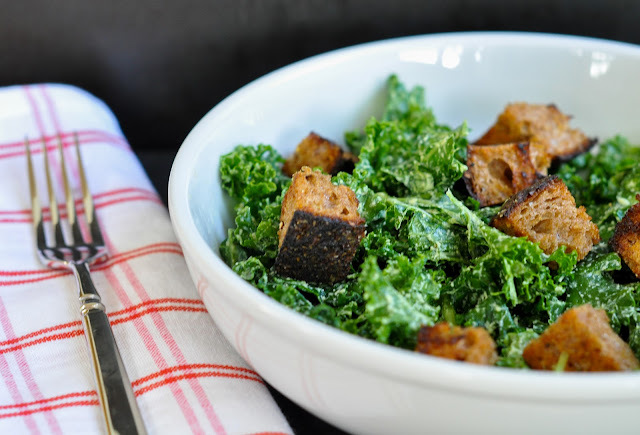 lacinato kale salad , miso kale salad with miso roasted tofu, kale, cranberry, apple and toasted almond salad with lemon dressing, kale salad with tahini & lemon dressing. Yum! I just stumbled upon your blog and I must try this! I have a fridge full of kale just waiting to be put into this salad. And I agree that kale is just an all-round ‘healthier’ choice compared to most lettuces, plus dairy can cause inflammation for a lot of people, so generally a non-dairy salad dressing ranks as healthier in my books. Either way, I have absolutely no problems calling this a healthy take on a caesar salad… that’s what I’ll be calling it when I serve it up in the very near future! Hi Erin! I totally agree with you. I do think kale is a healthier choice than plain old romaine. If you love kale salads, then try you have to try my lacinato one or my miso one. Those are my two favorites! You could omit the cheese in them as well! Nice! Sounds great and I will absolutely have to try them 🙂 I do love me some kale! Thanks for all the nutritional info Em. You are my nutritional expert. I will make this salad for you when you come visit me at my casa. What a terrific looking kale salad. I am so intrigued by that cashew dressing. i didn’t know you had to soak raw cashews and am just becoming familiar with raw nuts. The date must add a little sweetness. BTW, cousins are coming for the weekend and they saw the hamburger on the blog. Guess what I’ll be making for their visit!! Hi Sarah! Awesome! Those burgers are a crowd pleaser for sure. Don’t you love it when friends or family order dinner off your blog? My kids sometimes go through my blog for dinner or dessert suggestions. What a fantastic looking salad! What a fantastic variation of this salad… Looks really delicious!! I never understand why people want to call salads that are not Caesar salads Caesar salads. What this salad has in common with Caesar salad is croutons and lemon juice and garlic — not so much, really. Whether it is healthier is also arguable: most of us can use the vitamins and protein found in anchovies, egg and a moderate amount of cheese and there is nothing wrong with romaine lettuce either. Delicious healthy salad – I somehow think of kale as cold weather food – but you’ve just proved me wrong – looking forward to trying this! Thanks Mary! I had a warm kale salad yesterday at this cafe and it was amazing and so comforting so I look forward to trying some warm kale recipes come fall. Hi Heidi! Thanks for stopping by. I pick my kale up at the local grocery (they do get it fresh from the local farmers) but plan on hitting the farmers market more this summer when my kids are out of school. It’s going to be our new summer Thursday outing.